For 2019, I decided to invest in an official Hobonichi! I was using a Stalogy notebook which is comparable to a Hobonichi but not the same. For those who might not know a Hobonichi is an everyday diary, one page a day for a whole year. 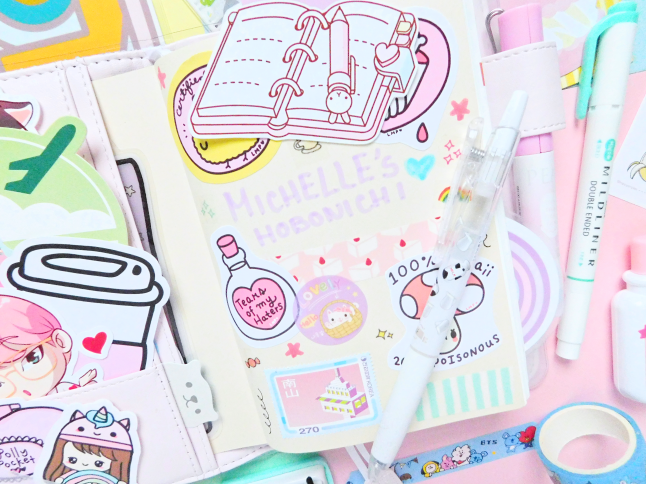 I'm very excited to use a Hobonichi this year but also very nervous! 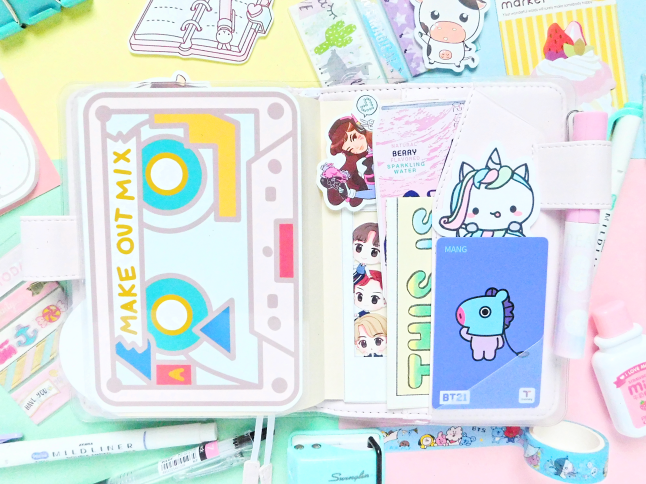 Since posting my last Hobonichi setup blog post, I've cleaned out, rearranged, and added some new things inside my cover so today I'm going to share my Hobonichi setup for 2019. 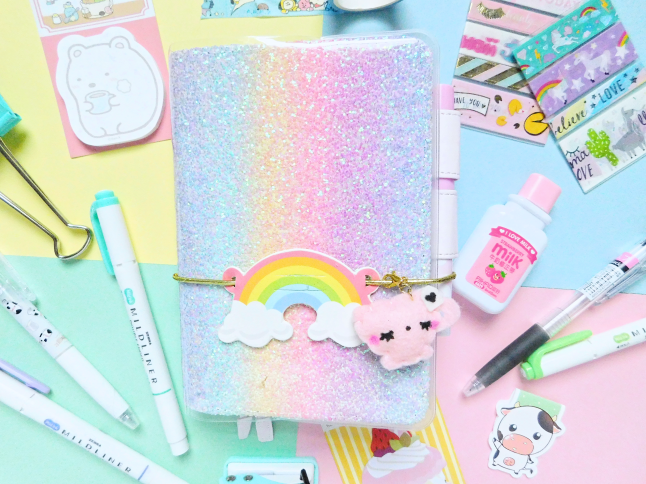 I'm still using my glittery rainbow Hobonichi cover that I got from eBay. I changed the clear cover to a basic clear because I thought the other clear cover was too much with the print. The rainbow band is from a kit I bought from Michael's Craft Store. The pink teacup charm from LoveNeen. On the side, I keep my Snoopy washi tape scissors for easy access for when I'm journaling. In the inside cover, I have several different die cuts and stickers, for decoration. In the top pocket, I have a chibi cow die cut from HelloPaperCat. The pocket underneath contains an ice cream die cut I made from a card and Starbucks postcard that a friend gave to me. The bottom pocket holds a BTS V die cut and a travel coffee cup die-cut. 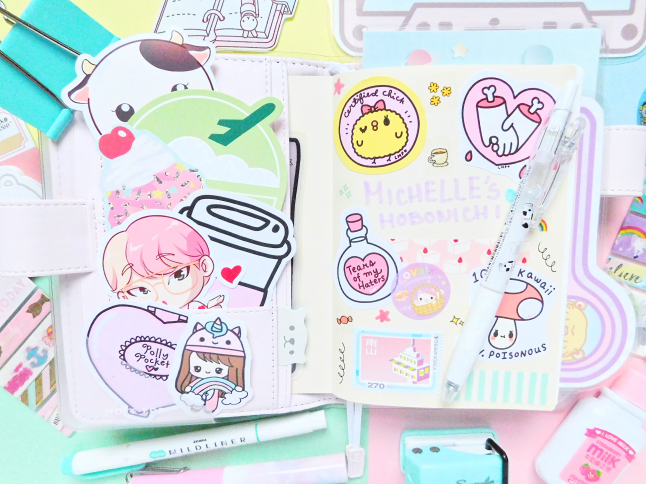 On the cover sleeve, I keep a Polly Pocket die cut and a kawaii die-cut from StationeryHeavenCo. On the right, I decorated the inside cover page of my Hobonichi. Most of the stickers are from Chichilittle. 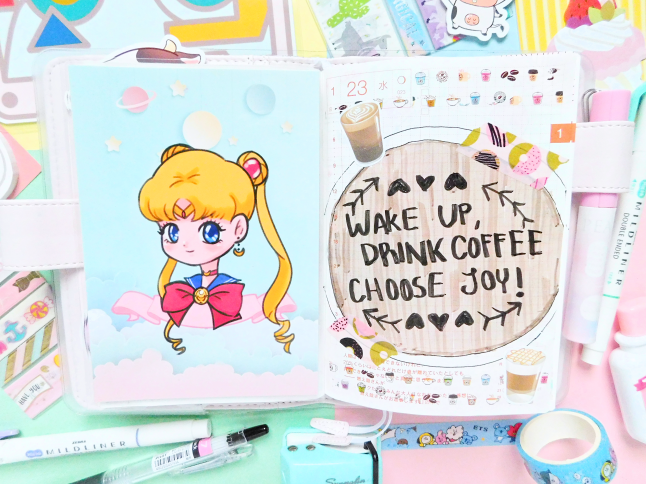 Now, I'm going to share some of my favorite Hobonichi pages I've created so far. 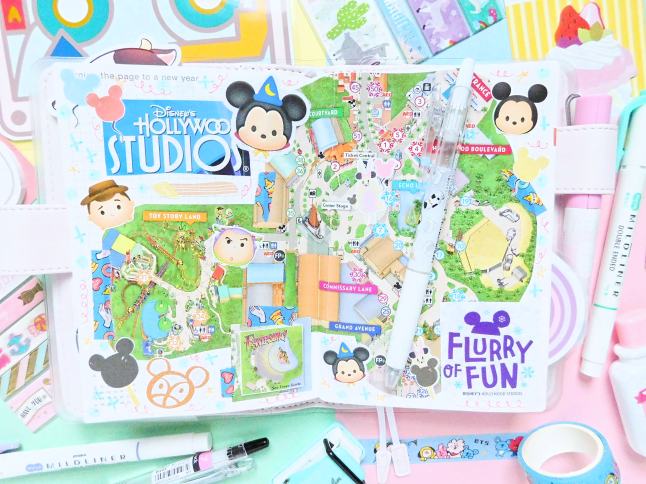 I spent New Year's Eve and New Year's Day at DisneyWorld so I decorated the blank pages before January 1st with the map of Hollywood Studios along with some Disney stickers. 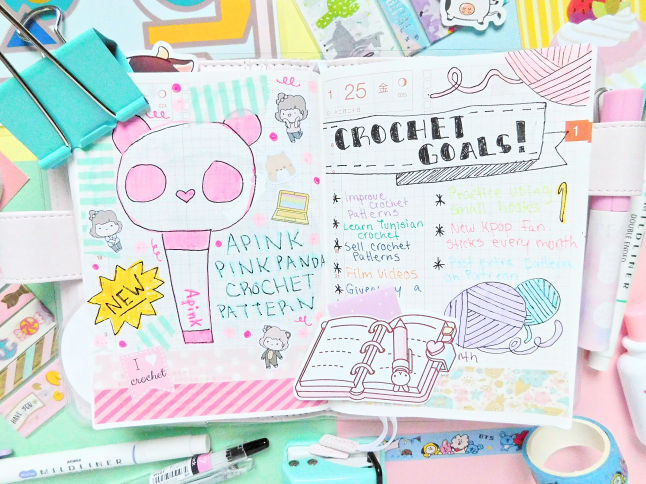 Let me know if you would like to see more of my Hobonichi pages in the future. Maybe, I can share my favorite pages every month? Finally, we've reached the back cover of my Hobonichi. On the furthest pocket, I have a GOT7 polaroid die cut from HelloPaperCat and a D.Va sticker from Vickisigh. On the next pocket, I have a La Croix cut out and a cartoon that came with the Hobonichi. 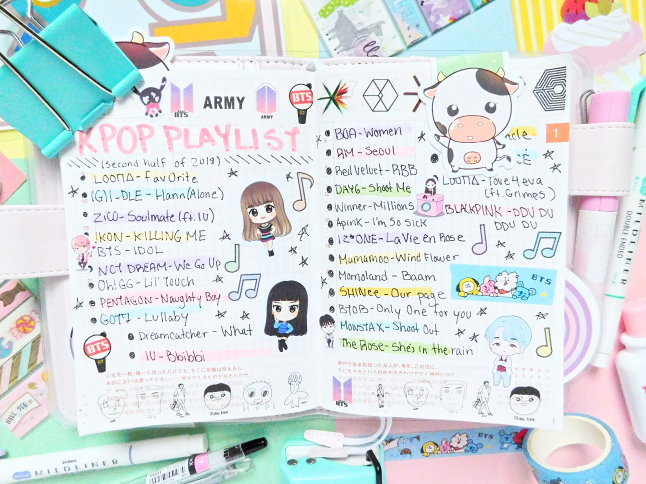 On the front pocket, I keep a Unicorn dango from StationeryHeavenCo and BT21 Mang card. 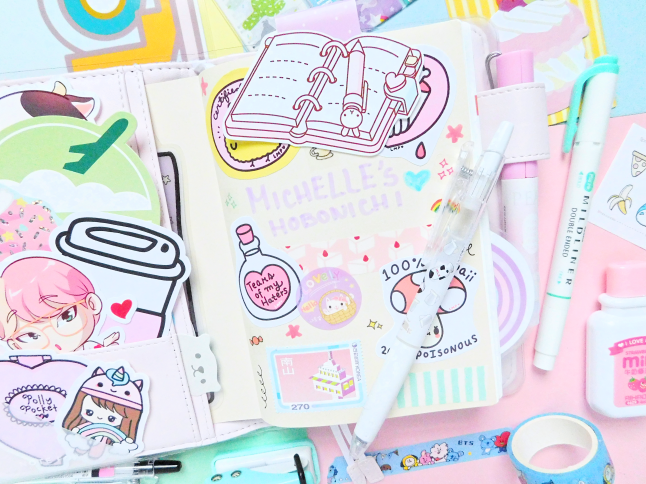 Are you using a Hobonichi in 2019?